Rajasthan Royals 177-6 (Rahul Dravid 46, Shane Watson 36, Ryan Harris 4-34) beat Kings XI Punjab 134-8 (Shaun Marsh 34, Azhar Mahmood 24, Shaun Tait 2-18) by 43 runs. Rajasthan Royals hammered 177 runs for the loss of six wickets in the measured 20 overs and restricted King XI Punjab for 134 with two wickets in hand after the last ball of the required overs was bowled. Shane Watson (Rajasthan Royals) was declared ‘Player of the match’ for his all round performance as he smashed 36 from mere 17 balls and also held two wickets. The 48th match of the Indian Premium League was played on Saturday, May 5, 2012 at Punjab Cricket Association Stadium, Mohali, Chandigarh. Earlier, Rahul Dravid, the captain of Rajasthan Royals, won the toss, opted to bat and lost their first wicket for just seven runs in 1.2 overs. Shane Watson joined in with the skipper with the different ideas as the flow of runs was instantly boosted up by the duo. Dravid opened up by hitting three consecutive fours in the fourth over of Ryan Harris and picked up another two in the following over from Praveen Kumar. Watson kept the score board moving and dispatched 15 runs in the sixth over with one six and two fours and brought up first fifty of the total. He floated another six on the fourth ball of the eighth over off Piyush Chawla but lost his wicket on the very next ball for 36 off just 17 balls with 2 sixes and 4 fours. The second wicket contributed 69 runs as Ashok Menaria joined in with Dravid who kept on assuring at the other end. 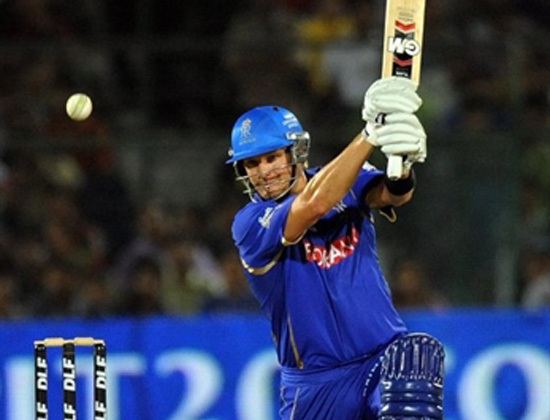 Menaria hit two consecutive sixes in the 12th over of Chawla as Rajasthan Royals crossed the hundred runs mark. The duo strengthened the score to 117 in 13.2 overs as Rahul Dravid was caught by Parvinder Awana at third man off Harris for 46 off 39 deliveries with 8 sweetly timed fours. Menaria was gone after the addition of 16 runs in the total at his personal landmark of 34 from 27 balls with two sixes and one four when Brad Hodge and Johan Botha took command in the centre. Hodge was the most aggressive of the two and lost his wicket on the fourth ball of the last over for 36 off 23 deliveries with two sixes and even fours after contributing 43 runs for the fifth wicket. Botha remained unbeaten for 14 off 8 balls with 2 fours as Rajasthan Royals amassed 177 runs with four wickets in hand. 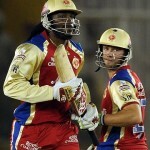 Ryan Harris was the supreme bowler and grabbed four wickets whereas Piyush Chawla chipped in with a couple of wickets. Kings XI Punjab lost an early wicket as well at eight runs when Shaun Marsh tried to establish the innings with little assistance from the other end. Rajasthan Royal bowlers took over and the runs were difficult to achieve as wickets kept on falling at regular intervals and the pressure mounted over Marsh. He tried to accelerate the run rate but became the fourth victim after scoring 34 runs off 24 balls with one six and 5 fours. The home team was in dire trouble after losing their four top order batsmen for just 59 runs in 8.3 overs. Azhar Mahmood and the young debutant in IPL Gurkeerat Singh gave some resistance to the lethal bowling attack of Rajasthan Royal. They crept to 95 runs in 14.5 overs when Azhar was clean bowled by Stuart Binny for 24 off even deliveries with the assistance of one six and a couple of fours. Gurkeerat was the next batsman who went back to the pavilion after the addition of 17 runs to the score at his personal feat of 23 off 24 balls with 2 fours. The late order batsmen were unable to impress and Kings XI Punjab managed 134 runs for the loss of eight wickets at the end of the 20th over. Shane Watson, Shaun Tait and Johan Botha took the honours of the day by grasping two wickets each as Siddharth Trivedi and Stuart Binny claimed one wicket each. Rajasthan Royals won the match comprehensively in the end by a good margin of 43 runs and accumulated two valuable points in their tally. Rajasthan Royals – 10 from 11 games at a net run rate of +0.144. 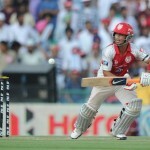 Kings XI Punjab – 10 from 11 games at a net run rate of -0.453.